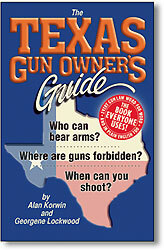 All the Texas gun laws -- not just the partial set Texas DPS distributes! This book is really the result of all the help we received, great and small, from the good people who shared their thoughts and resources with us. Thank you. Larry Cooper, Marksman Indoor Range, Inc.
Steve Hall, Conservation Ed. Dir., Texas Parks & Wildlife Dept. Joe McBride, President, McBrides Guns, Inc.
Harold D. Oates, Captain, Texas Parks & Wildlife Dept. Karl N. Olson, Security Officer, Texas Parks & Wildlife Dept. Carlos Vaca, Asst. Commander, Texas Parks & Wildlife Dept. implementation of the complex 1995 Right-to-Carry law. The Texas River Authorities cooperation was greatly appreciated.